July 14, 2015 – San Jose, Calif. – FlexTech Alliance today announced the successful conclusion to its Large-Area Roll-to-Roll In-Line Surface Metrology Program with 4D Technology Corporation of Tucson, Arizona. The product, the FlexCamTM Defect and Roughness Metrology Module, was launched to substantial interest in February at 2015FLEX in Monterey and will be featured in several upcoming events. This project was started in 2012 with the intent of developing high-speed inspection and measurement — two important measures of success in roll-to-roll manufacturing of electronics. 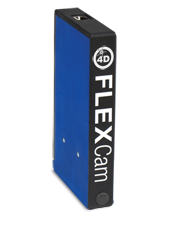 View more details on the 4D Technology FlexCam. FlexTech Alliance is a leading industry association focused on growth, profitability, and success throughout the manufacturing and distribution chain of flexible, printed electronics, and displays. By facilitating collaboration between and among industry, government, and academia, FlexTech Alliance develops solutions for advancing these technologies from R&D to commercialization. For more information on FlexTech Alliance, visit www.flextech.org.